He said America shouldn’t have to apologize for slavery and has gone after Civil Rights icon and fellow congressman John Lewis. He claimed most undocumented immigrants were "drug mules" with "calves the size of cantaloupes" from hauling drugs across the Mexican border. And recently, he drew widespread outrage — along with a shout-out from David Duke — when he tweeted his support for an immigrant-bashing Dutch politician saying civilizations can’t be restored with "someone else’s babies." 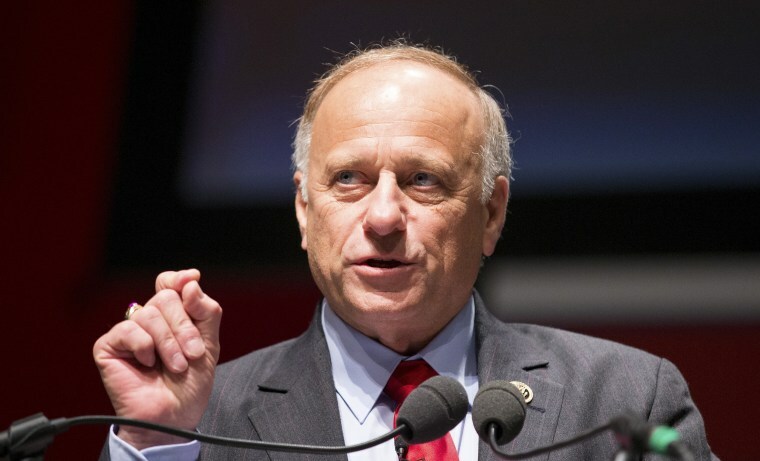 Despite it all, Republican U.S. Rep. Steve King remains extremely popular back home in the mostly rural 4th Legislative District in northwestern Iowa, much to the dismay of critics who flat-out call the 67-year-old lawmaker a racist. "King could use N-word daily, still get reelected here" was the headline gracing a column written last July by Douglas Burns of the Daily Times Herald newspaper in Carroll County. "I stand by that," Burns told NBC News on Wednesday. "I think that says as much and more about us as it says about him." Chuck Offenburger, a former Republican activist and blogger and longtime King critic, agreed. "I'm afraid he’s a racist," he said. "My feeling on it is when someone in his position makes one statement that appears to be racist, maybe you can look into his background and try to understand and maybe even forgive him. But we’re going on 16 years and he’s just gotten more and more inflammatory." "At election time people have to choose sides and culturally they are more comfortable with King, who is staunchly anti-abortion and pro-gun." King did not respond to emails and phone calls to Iowa district offices to rebut the racism charges or weigh-in on why he continues to have the support of voters back home. But Kim Weaver, the Democratic challenger King crushed in November to win his eighth term, says she’s raised nearly $100,000 since her rival’s controversial tweet went viral and thinks "he is vulnerable." "I would say that is an understatement," Weaver told NBC News. "Since that, I have gotten 4016 contributions and about 12,000 new Twitter followers, including Rosie O’Donnell, who are urging me to run again." Good luck with that. Since he was first elected to Congress back in 2002, King has racked up victory after victory — often by huge margins — despite his lengthy record of rattling off remarks that have been branded bigoted, and despite having few significant legislative accomplishments to his name. "He’s become such a lightning rod other members of Congress, even in his own party, don't want to work with him," Offenburger said. King has also defeated bigger names than Weaver, including Christie Vilsack, the wife former Iowa governor Tom Vilsack who Offenburger supported. King beat her in 2012 by a solid margin of 53 percent to 45 percent. "In the primary, King had a legitimate challenger in State Sen. Rick Bertrand of Sioux City and he did nothing against King," Offenburger said. "King just beat his brains out." Tom Vilsack said "Iowans find it hard to fire folks," pointing to the lengthy tenures of Gov. Terry Branstad and Sen. Chuck Grassley. Vilsack, a Democrat, chose not to seek a third term. Steve King and Joni Ernst, then an Iowa Republican Senate candidate, help out on the grill at the 2014 Iowa State Fair in Des Moines.Tom Williams / CQ-Roll Call,Inc. "I think he has in the past catered to the economic insecurities of people living in small towns that have seen their communities shrink over time as their children and grandchildren have left," Vilsack said. Joe Enriquez Henry, national vice president Midwest region, League of United Latin American Citizens, has been behind an effort to organized Latinos in Iowa to increase participation in caucuses and elections. "There’s legions of people who have this hate and this lack of information and knowledge about immigrants, minorities about the history of our country,” Henry said. “He has followers who think the same due to lack of education." King’s sprawling district covers 49 counties and is 93 percent white and about 6 percent Hispanic, with only a smattering of blacks and Asians in the mix, mostly in the bigger burgs like Sioux City and Ames. It’s also rock-solid Republican and culturally conservative, Burns said. "Day to day, people interact very locally and they are isolated from diversity," said Burns, whose family owns his paper. "It's not like there’s overt, aggressive racism. The statement about 'Iowa Nice' is true." "We’re going on 16 years and he’s just gotten more and more inflammatory." Still, there is a deep divide between white rural Iowans who have "egg-basted themselves with the Republican Party" and the city folk who favor the Democrats. And King, a college dropout who ran a construction company before wading into politics, has proven adept at exploiting that divide. "He’s got a natural connectivity with people," Burns said. "Most rural Iowans look at him as one of theirs and reflect his values." That doesn’t mean they always agree with King’s incendiary remarks, Burns added. "But at election time people have to choose sides and culturally they are more comfortable with King, who is staunchly anti-abortion and pro-gun," Burns said. "And King, as impolite as he might be, as racist as I believe him to be, he speaks in a very unapologetic, unbending way from a rural perspective." And if the Democrats don’t find a way of reaching these voters, "you’re going to feed the beasts like Steve King," Burns said. Offenburger said King's secret weapon is that he's an affable guy. "Hell, if he walked into my house right now we’d sit and talk for a couple hours and get on just fine," he said. “He’s pleasant and fun to be around. Even self-deprecating." King is also "a really effective public speaker," Offenburger added. "They like his mouth, they like his enthusiasm for standing up and back-talking to and about things people here either fear or don't understand," he said. "He can fire up a crowd. He’s got those political skills. I’ll give him credit for that." King is also adept at playing on his constituents’ fears. "People here are scared to death of things like ISIS," he said. "So they become skeptical and leery or all people from other nations. Anybody of different ethnicity." "We’ve seen a tremendous arming of northwest Iowa. The number of people packing heat here is worrying. And King plays into that with his AR-15 (assault-style rifle) at home and all that crap." What King doesn’t do, Offenburger said, is look very far beyond his next election. For example, before turning into a pitbull supporter of President Trump, King backed Texas Sen. Ted Cruz. "Ted Cruz is backed by big oil, and the farmers here grow crops for ethanol and they noticed that," Offenburger said. Local farmers also supported the Trans-Pacific Partnership deal that Trump scrapped with support from King because the soybeans they grow mostly wind up in Asia. "King, like all good politicians, has been phenomenally lucky," he said. "Throughout most of the time he’s been in office it was pretty good economically. Agriculture has done really well with the introduction of ethanol. But the last two or three years agriculture has really softened-up and King is going to have to face that fact." Burns said King needs to keep his focus on Iowa. "If Trump does come with an infrastructure bill, I would like my congressman spending more time on that, on working to protect our ethanol industry, on working to repopulate out county," he said. "When King gets involved in politics in the Netherlands that’s time he’s not spending time working on rural issues. And people here notice that."